There's also a sizable discount if you'd like to keep it. Hey, remember Civilization: Beyond Earth? Wow, those are some loud crickets. I think a hefty discount on both the base game and its Rising Tide expansion would convince me to give it a go, but it hasn't yet plummeted to 'Ah crap, now I HAVE to buy it' levels, at least for me. 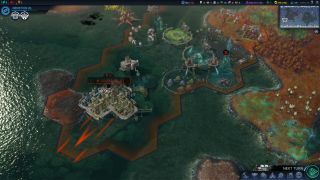 If I had time this weekend, perhaps I would take advantage of its free weekend offer; Firaxis' game is free to play until Monday, July 18 at 10 a.m. Pacific. Interestingly, it's not a free weekend hosted by Steam, but rather Humble, and you'll need a free GameSessions account in order to take advantage of the offer. You can grab the temporarily free sci-fi 4X here, and if you're won over, the game and its expansion are both on sale over the same period: the main game has had a 70% price cut, while the expansion is currently 40% off. Have a read of our reviews of the base game and the Rising Tide expansion at these links.